At this point, if I manage to even make it to my own art reception, I will consider it a huge accomplishment. 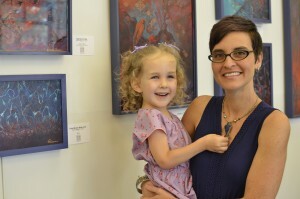 Almost every time I have an art show scheduled, there is some sort of family catastrophe the week before. When my son was 3, he broke his arm just days prior to a huge event. This last week all but my husband was in quarantine due to a seriously contagious illness contracted from my daughter’s pre-kindergarten class. Organizing and preparing for an art exhibition is challenging in and of itself; but, add into the mix the demands of motherhood, and the goal reaches astronomical proportions. Not only do I need to arrange the details for the event itself, but also the care of our children. I suppose some would assume we would just easily find sitters for our children during the hours of the exhibition. On occasion we will, depending on the venue, time of the event and our budget. However, we also believe in the importance of our children being present and made a part of what we are doing, if at all possible. I desire this to be a family investment. Yet, I also realize the need for realistic expectations. They are small children, not adults. Their interest and stamina for art gazing is minimal. I try to make accommodations for this by packing a bag of things to occupy them and arranging friends to help engage them should my husband and I be occupied. But our children are part of the story, often the very inspiration to my creating. Their presence makes it all that much more richly complete, even if a bit a more chaotic. Involving them makes it less about me, with our presence as a family speaking a greater testimony. It keeps me humble and encourages me to let things go rather than try to control them. It saves me from taking myself too seriously and leaves me grateful for even small accomplishments. And, it provides encouragement when my daughter shadows me and my seven year old son passes out his mom’s business card on his own initiative. I want to live out my calling in front of my kids and not behind a locked studio door. In allowing them to witness the process from being to end, challenges included, I hope they will be enriched and inspired to follow their own unique passions in spite of hardship. I feel blessed to have the opportunity to pursue my passion while also having the gift of a family. I am determined that being a practicing artist and a present parent can co-exist.